According to the stipulation of “design standard for the design of building structures (GBJ 68-84)”, the probable results of structure damage (endanger people's lives and caused economic losses, social impact, etc.) can be divided into important buildings, general construction and the secondary. When designing the corresponding security level is divided into one, two, three level. Important building should choose good quality steel. Structure on the load is divided into static load and dynamic load, long-term effects or accidental action, often carrying load or underload. 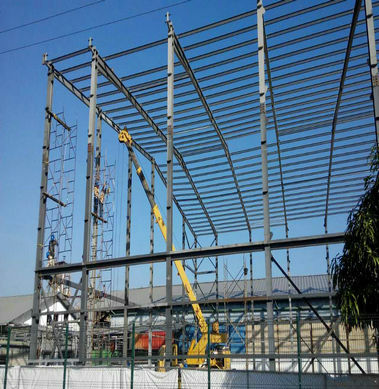 Choosing the appropriate steel based on the characteristics of load, and put forward the necessary quality guarantee the project requirement. To structures directly under dynamic loading, should choose quality and toughness good steel. Steel structure connection is riveting, bolt connection, weld connection, etc. For welding structure, when welding the uneven local heating and cooling often make the component produces high welding residual stress, welding defects often makes the inner class structure crack damage, the integrity of the welded structure and easy to crack through the weld and extension, in addition to sulfur, high carbon content will affect the welding performance of steel. So the quality of the welding structure of steel should be better than the steel welded structure, in particular to control the content of carbon, sulfur and phosphorus.